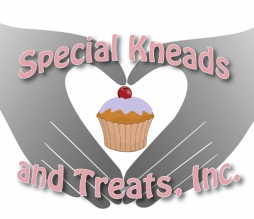 Specials Kneads and Treats is a non-profit specialty bake shop designed to provide Special Needs adults within the surrounding community a place to learn a skill and develop a sense of accountability and pride. We cater to local Food Ministry Cooperatives, Elderly Care Facilities, Battered Women and Childrens homes as well as many small locally owned businesses. Our program allows this special group of people an opportunity to provide for those less fortunate or in need. Profits from standard sales are injected back into community programs to further assist Special Needs awareness, research and many other areas of need.